New Georg Jensen Serving Fork! Author Topic: New Georg Jensen Serving Fork! 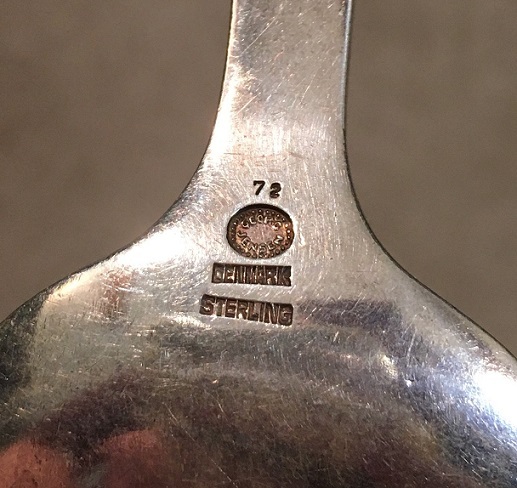 Why are some of Jensen's pieces hallmarked with the Danish hallmarks, (The castle, etc) and some, like mine, just stamped sterling Denmark all in the workshop? Did they relax the hallmarking requirements at some point? "As the 20th century progressed, the official state hallmarks are found less and less, they were officially retired in 1977, it had already become common practice for pieces to be marked only with the maker’s initials, 925S and sometimes Sterling and “Denmark”." I just did a search for "danish silver hallmarks"
Two different web sites have the same information, but I really do not know if this is accurate. Does anyone know which year this was designed? And was this pattern designed by Georg Jensen? I see this information on the internet for the common patterns, but this pattern is uncommon and I cannot find much information at all about it. Unfortunately I have no books on Jensen. Danish marks don't always follow the regulations - from 1893 (act of 1888), it was required that pieces should bear a maker's mark, and an indication of the fineness, whether indicated by official 'three-tower' assay marks (indicating at least .826 fineness, .830 after 1915), and/or the fineness stamped numerically followed by an 'S', have seen numerous anomalies in Danish marks over the years. If I recall correctly, Georg Jensen switched to all sterling production in 1932, and well-known respected firms like Jensen, Peter Hertz, Cohr, etc. often didn't have their work assayed. Concerning the pattern, would have been known as simply 'No. 72', Drucker's 'Georg Jensen: A Tradition of Splendid Silver' (2nd ed., 2001) shows your fork and a server on page 294, not dated but described as designed by Georg Jensen. Hi Cheryl. Does the phrase 'designed by Georg Jensen' refer to something Georg himself personally designed, or can it also refer to the company including designs either designed in conjunction with Georg or entirely by his talented assistants?